The first time The Astronomer and I dined at Sugarfish by Sushi Nozawa, we were guests of the restaurant and were treated to a magnificent experience—the fish was impeccable and service was a dream. 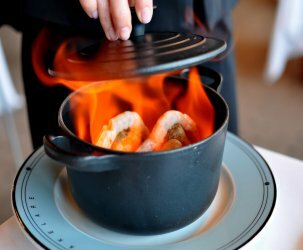 While I could have written a glowing review based on my initial visit, I wanted to dine here a second time to make sure that my meal wasn’t an anomaly reserved for blogger-types wielding unusually large cameras. The Astronomer and I returned to the restaurant late last week with our friends Andrew and Miri. We were excited to introduce them to Chef Kazunori Nozawa‘s “Trust Me” style of sushi that has made him a notorious character in the L.A. sushi scene. In Chef Nozawa’s book, there is no greater offense than serving mayo-laden rolls heavy with bells and whistles. Instead, he prepares pristine fishes, minimally fussed and buttery on the tongue. 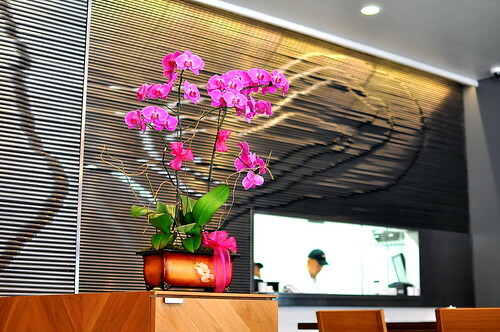 With three branches across the city, Sugarfish aims to bring an authentic Nozawa experience to the discerning masses. 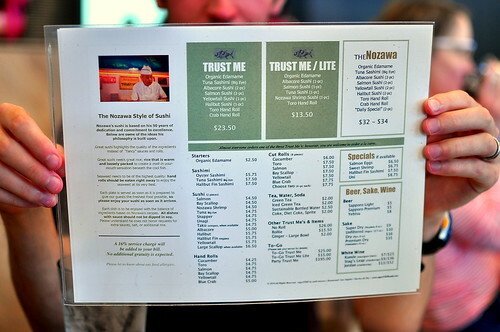 The three “Trust Me” menus are priced markedly lower than a meal at the chef’s original Studio City outlet. 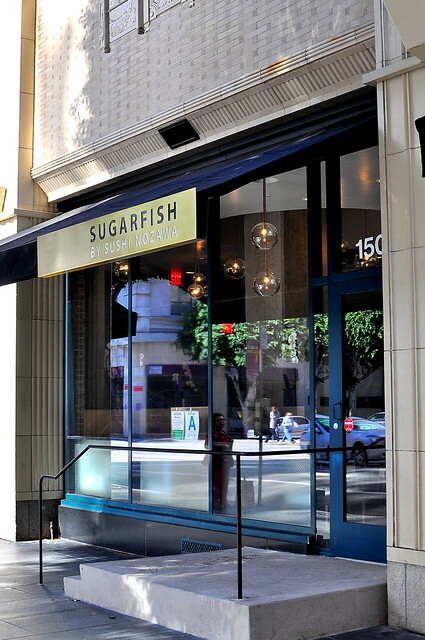 Sugarfish is able to keep prices in check by taking advantage of the chef’s personal contacts with fish vendors, preparing the fish efficiently in a kitchen rather than behind a sushi bar, streamlining the menu to reduce waste, and serving diners at breakneck speed. 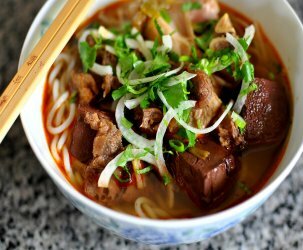 Jonathan Gold wrote back in 2008 that “the elapsed time between the second you sit down and the moment you are handed your check is about 15 minutes, 20 tops. Sugarfish is reasonably priced for sushi, but per minute, it may be one of the most expensive restaurants in town.” While our experience wasn’t that hurried, Mr. Gold makes a very valid point. 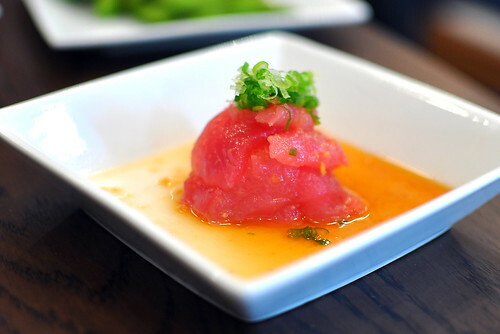 Pricing and pacing aside, the quality of food at Sugarfish is truly unparalleled. Every cut of fish served in the restaurant is handpicked by Chef Nozawa, fresh rice is made every 30 minutes, and all the sauces are prepared from scratch. Now, if they didn’t serve it up so gosh darn quickly, I’d be in heaven. 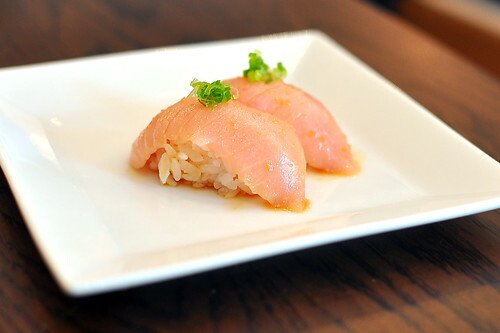 …it was followed by a supple stack of tuna sashimi resting in a pool of house-made ponzu sauce. 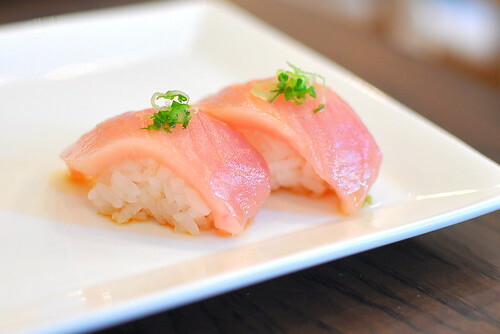 The real fun began when the nigiri arrived on the scene. 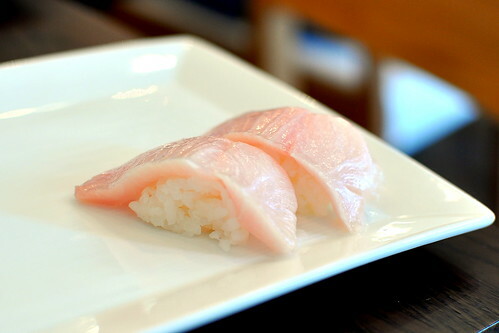 Each slice of fish was presented on warm, loosely packed rice. I preferred to eat each piece with my fingers to avoid a crumbly mess. The albacore was served with a bit scallion and ponzu sauce. The warm rice coupled with the cool and silky fish was simply fantastic. and albacore belly with house ponzu sauce. All of the “Trust Me” menus include at least one hand roll. 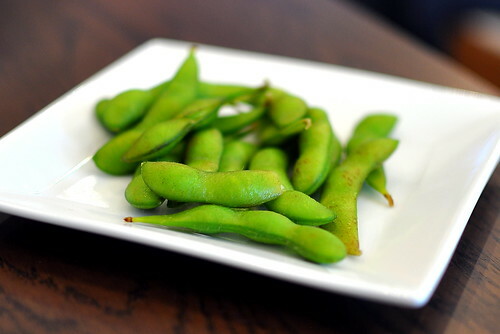 Diners are encouraged to eat these as soon as they hit the table, while the seaweed is properly crunchy. Both the crab handroll with housemade mayonnaise and toro handroll (not pictured) were delicious, but disappeared much too quickly. As a guest of the restaurant, I was served at a leisurely pace that I found suitable for conversation and relaxation. However, on my second visit on a Friday night, the food came out fast and furiously. Conversations were halted as soon as a plate of sushi arrived because we were encouraged by our waitress to eat our food at its peak of deliciousness. I’m all for heeding the Chef’s vision, but will make sure to leave my friends at home next time around. 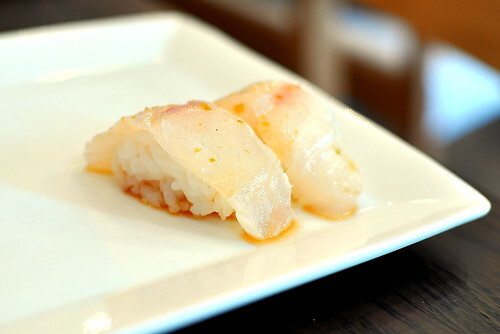 Sugarfish is a must-try restaurant for any sushi lover, but it’s best to go here solo. Interesting take – I’ve never really felt hurried during my couple of times here. At least for lunchtime, it does fit the downtown lunch crowd so I can squeeze in a meal under an hour. Would it have been inappropriate to tip the bowl and drink the ponzu sauce? I think I would have done it regardless. While I have never felt hurried per se, it’s certainly not a luxurious pace. 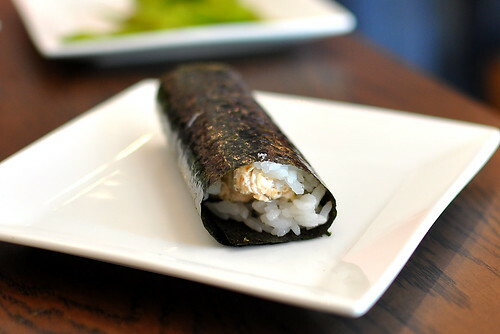 But the food, especially those hand rolls, is fantastic! The food looks absolutely amazing. Love your blog. It’s amazing how much I trust you, considering I don’t know you. 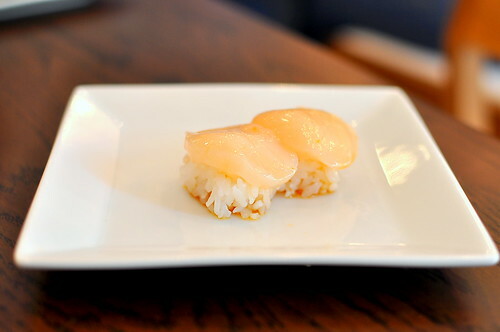 I really like Sugarfish–it’s such a good bang for the buck–but I do agree that service is a bit hurried. To your point, the fast pace was perfect for the time I ate here by myself , but I would have hoped for service that was a tad slower the time I ate there on a lunch date with the hubby! 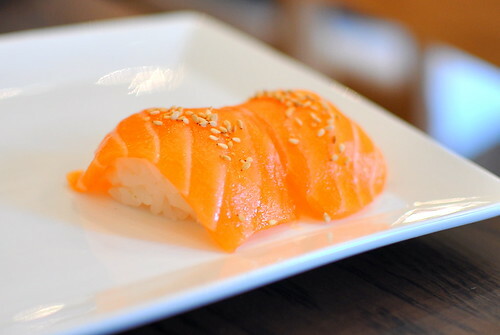 sounds like it could be too hurried…proper nigiri wouldn’t be served with warm rice. sounds like they need to slow down and let it cool! It’s definitely sounds like a place to get good eats, but you probably need to find a 2nd place to chat up with friends. This place sound perfect for me…Eat and Run…save all the chatting at an Ice Cream Shop or Coffee place. I never felt rushed–and I’ve dined at all 3 locations. 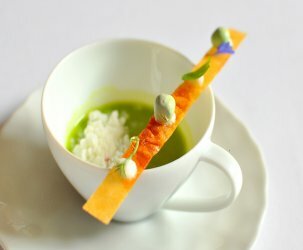 Food is consistently DELICIOUS..as a matter of fact, just reading this article made me salivate. Sugarfish exceeds my expectations every time! I am always looking for an awesome place to take my 83 yr old Mom who is a Tokyo born native. she has not been able to go “home” much but misses the unique taste of how true sushi is prepared and TASTES! This sounds like I have found the place and am looking forward to trying this place.